Prominent & Leading Manufacturer from Mumbai, we offer twisted quad rings. Twisted Quad Rings seals are four lipped seals with a specially developed sealing profile. A wide range of elastomer materials for both standard and special applications allows practically all liquid and gaseous media to be sealed. Avoids twisting in the groove. Due to its special profile, the seal does not tend to roll in the groove during reciprocating movement. Very good sealing efficiency. 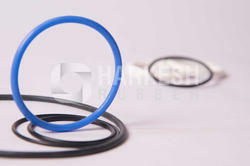 Due to an improved pressure profile over Quad Ring Seal cross-section, a high sealing effect is achieved. A lubricant reservoir formed between the sealing lips improves start up. Unlike an O-Ring, the mold line flash lies in the trough, between and away from the critical sealing lips. Looking for Twisted Quad Rings ?